An inspiring collection of ideas and projects for encouraging an artistic spirit in children! 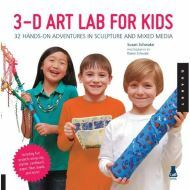 3D Art Lab for Kids includes 36 kid-friendly fine art projects in paper, clay, textiles, sculpture, and jewelry. Each project is inspired by the work of a prominent artist and is illustrated with step-by-step full-color photographs of the process as well as finished samples and variations. Whether you use these projects independently or as a curriculum for hands-on 3D art experiences, you’ll find that the lessons in this book are open-ended so they can be explored over and over–with different results each time! Colorful photos illustrate how different people using the same lesson will yield different results, exemplifying the way the lesson brings out each artist’s personal style. 3D Art Lab for Kids is the perfect book for creative families, friends, and community groups and works as lesson plans for both experienced and new art teachers. Children of all ages and experience levels can be guided by adults and will enjoy these engaging exercises.